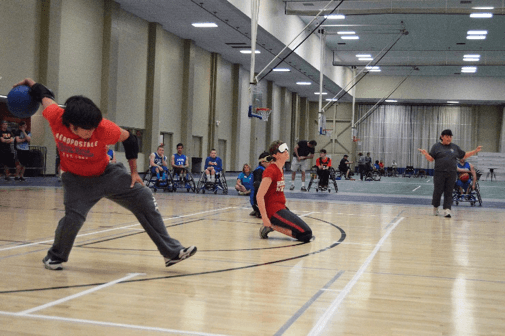 NIU’s Campus Recreation, in partnership with Great Lakes Adaptive Sport Association, and the Kishwaukee Special Recreation Association are proud to host this year’s Adaptive Sport Day. The event, geared toward educating and building new relationships, will be on Friday, March 24, from 4-7 p.m. at the NIU Campus Recreation Center. Attendees will get the chance to meet three-time Paralympian and Paralympic medalist Amanda McGrory along with other stellar athletes. Sharon Moskowitz, graduate assistant for fitness and wellness at NIU Campus Recreation, is the driving force behind this community event. “We formed the idea of an Adaptive Sport Day to not only showcase the wide variety of available sports for adaptive athletes and community members but to create a day of ability awareness,” said Moskowitz. The afternoon will be filled with demonstrations of sports like goalball, beep baseball, wheelchair basketball, all-abilities obstacle course and wheelchair football. Participants will learn, watch and play a variety of adaptive sports facilitated by Paralympic Sport Clubs, the Great Lakes Adaptive Sport Association (GLASA) and the Rehab Institute of Chicago (RIC). Enjoy generous giveaways from KIND Bars, Chipotle and Jimmy Johns!